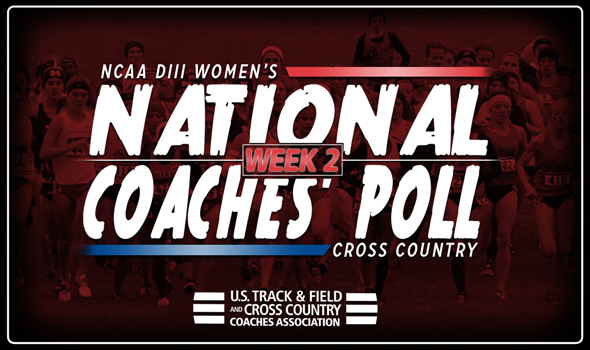 NEW ORLEANS – Winds of change swept through the NCAA Division III Women’s Cross Country National Coaches’ Poll in Week 2. While the top-9 remained the same from the previous installment, only two teams from No. 10 to No. 35 were able to say that as well. Johns Hopkins once again headlines the most recent poll released Wednesday by the U.S. Track & Field and Cross Country Coaches Association (USTFCCCA) and rightfully so, having cruised to the team title at the Paddy Doyle Meet of Champions this past weekend hosted by NCAA Division I Iona. The Blue Jays did so without their No. 1 runner, Felicia Koerner. Washington (Mo.) closed the gap on Johns Hopkins by gaining three points from Week 1 to Week 2, while MIT, Williams and SUNY Geneseo are a distant third, fourth and fifth. The fun begins at No. 10, where Claremont-Mudd-Scripps jumped two spots from No. 12. The Athenas have made a home for themselves in the top-10 over the past three years, being ranked inside its friendly confines 13 times in the past 21 weeks. UW-Eau Claire and Carleton both worked their way into the top-15 following strong efforts this past weekend at the St. Olaf Invitational. The 14th-ranked Blugolds, led by Sara Slattery, rolled to the team title at the St. Olaf Invitational and topped the hosts who were ranked No. 14 in Week 1 by 50 points. This is UW-Eau Claire’s best ranking in the past four years. The 15th-ranked Knights finished runner-up to UW-Eau Claire at St. Olaf and did so with three of their runners competing in their first 6K race. Bates and St. Norbert both improved five spots from Week 1 as the Bobcats went from No. 25 to No. 20 and the Green Knights from No. 26 to No. 21. This is only the fifth time in program history that St. Norbert has been ranked in the National Coaches’ Poll. Oberlin led a batch of three teams that either returned to the National Coaches’ Poll or were listed for the first time this season. The Yeowomen bounced back at the Otterbein Invitational and went from receiving votes to No. 24. Wheaton (Ill.) also received votes last week and is now ranked No. 28. Pomona-Pitzer jumped right into the conversation at No. 31. Be sure to check back in throughout the season as business is about to pick up. The 2017 NCAA Division III Cross Country Championships are scheduled to take place November 18 in Elsah, Illinois.